The Hytrol 190-ACC Minimum Pressure Accumulation Conveyors is the simplest method devised for accumulating cartons, boxes, etc. Basic design eliminates complicated adjustments and allows a minimum of 2% back pressure. 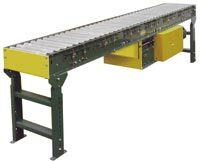 A minimum pressure accumulation conveyor allows multiple products to lightly touch other items while being moved along the conveyor line. This pressure (i.e., back pressure) is kept to a minimum. This eliminates damage to packages, The back pressure is adjustable. To accomplish this, the pressure roller is mounted in companion with adjustable springs which sense the friction. This configuration allows for an easy and trouble free operation, regardless of the of the accumulated load. Our minimum pressure accumulation conveyors do not require large motors. Pre-engineered lengths are available from from 5′ to 100′. Custom sizes are also available. 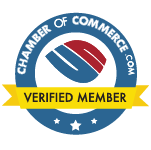 If you have any questions concerning specifications or configurations, pricing or availability, we have knowledgeable and experienced conveyor experts waiting for your call. Motor – 1.5 Horse Power standard, 2 Horse Power maximum. Capacity Rating – Maximum load capacity per linear foot is 150 lbs., Exceeding rated capacities are not recommended. The Hytrol 138-ACC – Minimum Pressure Accumulation Conveyors are the simplest method devised for accumulating conveyor items. Our basic design eliminates complicated adjustments, allowing a minimum back pressure of 2%. 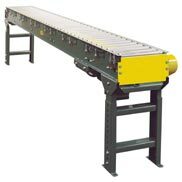 The Hytrol Model 138-ACC is a light-duty accumulation conveyor. It uses 1-3/8 inch rollers to allow up to 1,500 pounds with just a 1 horse power motor. Straight and curve conveyor sections are available in widths from 15 inches, to 24 inches. Many models are available for shipment within 24 hours. Call Today. 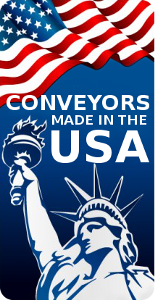 We have conveyor experts waiting for your call. Overall frame widths are available from 12 to 24 inch. Motor – 1.5 HP standard – 1 HP maximum.